In case you haven't noticed the Fair Isle motif is back and in full style. Everywhere you look there is a Fair Isle pattern or some sort of riff on it. Designers have taken the traditional pattern and updated it. The cross stitch world isn't going to let this trend go by. There are so many patterns out there now. If there is a fan base for something, there is a Fair isle design for it, from video games, comic books, movies to different animals and holidays. The patterns are no longer strictly limited to Christmas. Below is just a sampling of the traditional. contemporary and downright wacky Fair Isle cross stitch patterns around the web. So grab a cup of hot chocolate and enjoy the Fair Isle season. We seem to think of Fair Isle when we think of Christmas or the winter season. Mainly because it is a knitting technique and wearing a knitted sweater in the middle of 100 degree temps isn't likely. So, we take out our Fair Isle garb when the weather gets cooler and wear it with pride. 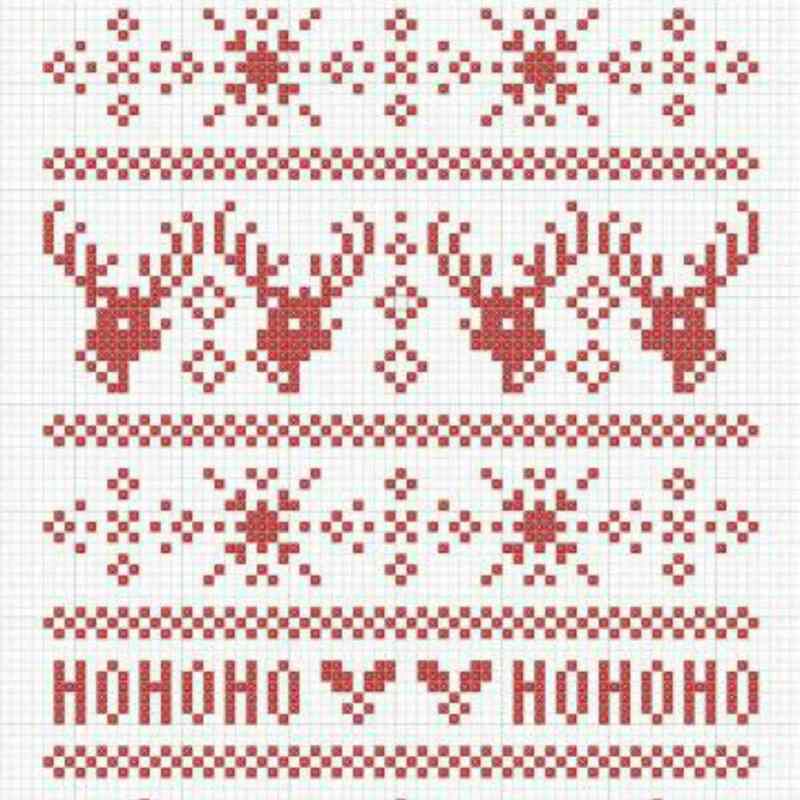 This Christmas theme pattern by Kincavel Krosses is the perfect example of holiday Fair Isle patterns. The "Ho! Ho! Ho!" says it all. You don't even need to open your mouth, just point to the cross stitch. As an added bonus to this fun pattern, you can download it for free on their website HERE. Remember, this is for personal use only! Please be respectful of the original designer and respect their copyright requests. If you are feeling adventurous, why not replace the "ho ho ho" with other sayings or symbols. Remember when I mentioned that new designers are putting their own spin on the Fair Isle idea? This Dr. Who Fair Isle cross stitch pattern by Amy Schilling is a perfect example. This pattern can be used as a knitting pattern or a cross stitch pattern. If you are feeling extra Dr. Who-ish, you could do both! This is the ultimate gift for any Dr. Who fan. You can stitch it on a scarf using waste canvas or why not knit the scarf and then stitch it up. Again, you can mix up the patterns to create your own look. You can also use different colors to make the pattern even pop more. Check out the pattern HERE. The Fair Isle design is one that will be around for a long time. It will continue to evolve and go with the trends of the day and yet still hold some of its traditional style. These patterns are usually seen during the winter seasons so they make great ideas for holiday gifts. You can add them to clothing, table cloths, pillows and other linens. If you use waste canvas, the possibilities on fabrid are endless. You can also create a one of a kind sampler that will turn into a family heirloom that can be shown all year round. You can also try different colors instead of the traditional red or black. Pick your favorite color and cross stitch your favorite Fair Isle pattern, If you can find one you like, make one up! Use your imagination and create your own style. Once you have a few ideas down, you can create your own pattern. Mix and match different patterns for a one of a kind design.